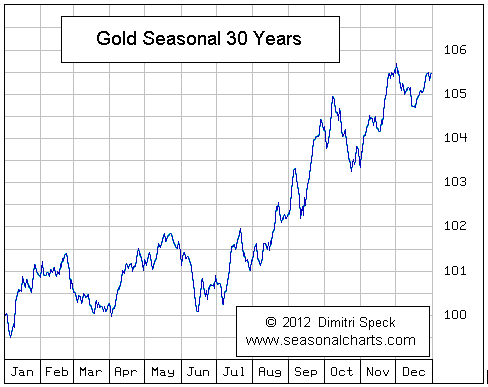 According to work compiled by Dimtri Speck, June historically has been the seasonal low for gold prices in USD. Why? The general explanation being nothing more than the summer vacation season causes less liquidity and seasonal holiday inventory re-stocking doesn’t begin until September. The gold market has been held captive by the threat of a Fed rate hike month after month for the past year. Traders knowing that investors remain on the sideline not wanting to get in front of market uncertainty following a rate hike sell short each rally confident capital flows into gold will not overwhelm their short position*. So far, so good. Physical buyers in the East remain willing buyers on the bid from Western sellers, but are not pushing price. We believe a Fed rate hike will prove to be gold bullish and a pivot point to higher gold prices just as it was in 2004. Any talk of rate “normalization” is another piece of market misinformation trying to lend credibility to a Federal Reserve that is mastering the pretend and extend game, in our opinion. Raising rates 200 or 300 basis points to “normalize” after almost seven years of a zero interest rate policy has the potential to set off a wave of untenable market dislocations that could possibly force the Fed to either forever be behind the curve or forced into a quick about face and return to QE with credibility lost. The Federal Reserve’s balance sheet is leveraged 77 to 1 with $58 billion of capital that may be wiped out on a mark to market basis within the first 100 bps. Total debt outstanding (private and public) has increased 45% since 2008 to over $104 trillion according to Federal Reserve statistics. McKinsey & Company estimates total world debt at $200 trillion against global GDP of $75 trillion. Sovereign debt has been financed with short-term durations in order to avoid ballooning budget deficits. Each 100 bps increase in interest expense for the United States is $180 billion. Total Interest rate derivatives at the beginning of 2015 amounted to $505 trillion in notional value, according to the Bank of International Settlement statistics, with $80 trillion tied to fixed forward interest rate contracts. Equity valuations models utilizing discounted cash flow analysis may need to be adjusted to account for higher discount rates and higher interest expenses, pressuring equity markets. In 2013, new home sales declined 25% when mortgage rates jumped 115 bps over ten weeks during the “Taper Tantrum.” Existing home sales declined 105 bps over the same period. Texas Governor Greg Abbott recently signed into law legislation to build a bullion vault that enables the University of Texas to house its physical gold holdings in Texas rather than in New York. The most interesting aspect of the bill is that gold housed in Texas will not be allowed to be confiscated by the Federal government. The move to repatriate gold from New York and London vaults follows on the heels of Germany, the Netherlands, and Austria to secure gold holdings on “home” soil. Besides the desire for greater control of gold holdings, there remains growing skepticism in the market about the number of paper claims on gold ownership versus the number of ounces housed in global bullion vaults. 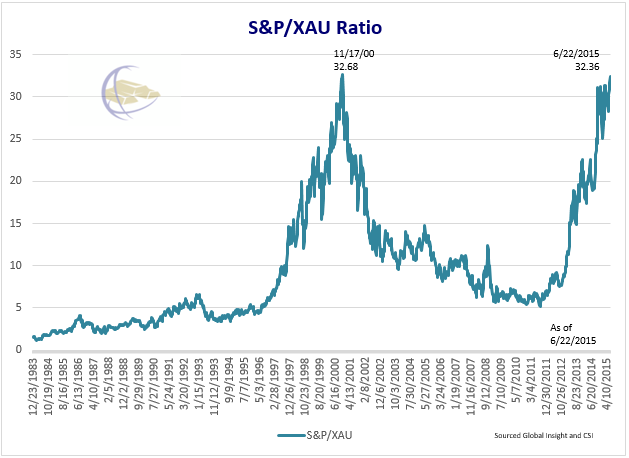 The S&P 500/PHLX Gold & Silver Sector Index (XAU) is approximately where it was at the worst of the bear market in gold and silver mining shares in November 2000. The Philadelphia Gold and Silver Index (XAU Index) is a market capitalization index of precious metal mining company stocks. The S&P 500 is an index of 500 widely held common stocks that measures the general performance of the market. The shift of gold mining companies to focus on margins rather than attempting to grow production ounces means the industry is going to revert back to raising cut-off levels and mining higher overall grade. 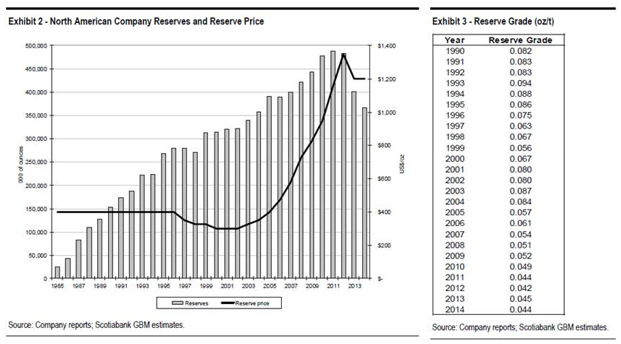 As you can see from the chart below, the average grade mined dropped from .08 in 2001 to .044 in 2014. For those miners with the flexibility and the deposits to mine higher grade ore, raising cut-off off grades should result in better cash flow, earnings and return on capital going forward. The flip side for the gold mining industry is that it means declining production profiles and reserves for a number of miners and reinforces our belief that global gold production is set to decline 30% over the next ten years unless gold prices appreciate 100%.